Art and Creativity - especially mandalas but with an occasional wild arty fling, mixed with musings about whatever is happening in my little world. All images copyrighted. Personal use is OK, and I'd love to know about it. Thanks! Bless me blog goddess, for I have been remiss. It's been more than a year since my last posting. It's not that I wasn't thinking about you - I really was. It's been a rough one - for me and everyone else, it seems. I thought we were gulping big chunks of change back THEN. Little did we know. One day at a time has been compressed to one moment at a time. My new mantra has become: In this moment, I am loved. In this moment, I am safe. In this moment, I am supported. And you know what? It's true. That simple, and still a mighty challenge sometimes. Making art helps. Friends who let you cry are invaluable. A purring cat on my lap can turn the light in my heart back on. If you'd like to learn how to paint mandalas, private instruction is available at $25/hour. All materials are supplied, except canvas, which I have available for purchase. My studio is in Laguna Hills, California. Please call 949-413-2251 to schedule. I suggest sessions of at least 2-3 hours. (I guarantee it will fly by - it's so much fun!) Bring a friend (up to 4 people total) and each of you will pay only $20/hour. Paint shy? "Not a creative bone in your body?" All workshops are suitable for absolute beginners. I provide a fun learning environment and a gentle teaching style. Already know how to paint? Great! Bring your unique style to the mandala form and dive right in! Please let me know the day before if you are coming. Come to paint, to be encouraged, to play, to be in the juiciness and support that happens when people create together. Use my paint and brushes, bring or buy canvas. -A good way to "get your feet wet" with mandalas and acrylic paint on a 12" canvas panel. You'll learn easy techniques to paint a background, then you'll pick a mandala template to transfer on top. Paint it in, add dimensional paint and maybe some crystals for extra shine. Good class for all ages and experience. Similar to the "Small is Beautiful" class, but even smaller little beauties! Make up to 4 mandalas by first creating the background, then using a template to lay a mandala on top. Finish with more paint and some fancy touches. These make great gifts and are just the right size for desks and altars. 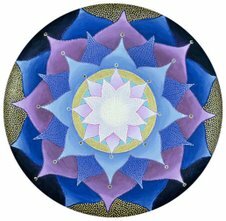 We'll explore the sacred feminine archetype as we paint a Lotus Mandala. Each class begins with a check-in, a meditation, and a short talk about mandalas, the feminine principle and how it is represented in the ancient symbology of the Lotus flower. No painting experience is required - really! I'll guide you through the design, painting, and embellishing. The techniques you will learn in this class can be used to create all kinds of mandalas on your own. The Spiral design really has lots of movement and depth, and is easy to create once you know the "secret!" Each class begins with a check-in, a meditation, and a short talk about mandalas and the spiral's geometric wonders. No painting experience is required - really! I'll guide you through the design, painting, and embellishing. 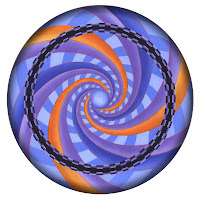 The techniques you will learn in this class can be used to create spiral designs on your own. Want to arrange a workshop for a group or a party? My colored pencil workshop is very portable and not messy - perfect for an afternoon gathering of coloring and talking. Think quilting bee, but with colored pencils on black paper. Everyone will go home with their own 12" square mandala. $40 per person - 3 hours. If you have a group that wants to take a painting workshop together, call me to arrange a date and time. I recommend the Small is Beautiful workshop. I can come to your residence or place of business. Making art, especially in community, is a powerful and nurturing experience, and is especially helpful in challenging times. Call 949-413-2251 to reserve your space or email me at charlotte@mandalavisions.com. May your day be blessed with beauty.